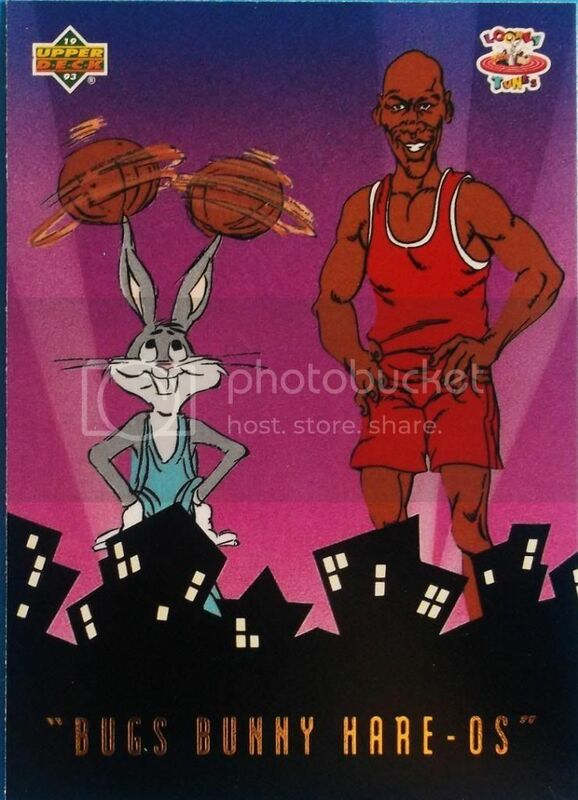 1993 Upper Deck Looney Tunes Bugs Bunny Hare-os #BBH3 – This is the only card on the countdown that isn’t in my physical possession. I know it’s back at my parents’ house because I used the holder it was in to transport that $2600 Kobe card. I can’t really explain why I like this card so much. Part of it is my obsession with Bugs Bunny. Easily my favorite Looney Tunes character (Pluto for Disney), I collected anything and everything Bugs. Pair that with my favorite sports figure and add a little foil and a hard to get insert format and you have a strong equation for success. 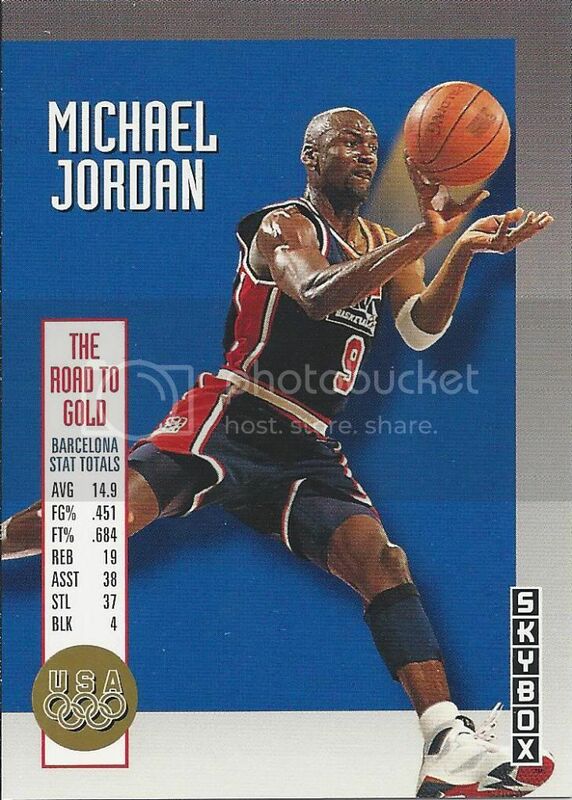 1992-93 SkyBox Olympic Team #USA11 Michael Jordan – We’re sitting at number 9 and it still isn’t technically the last USA card you’ll see. Again, aside from visceral nostalgia, I don’t have much to say to explain this one. The Dream Team was a young basketball fan’s…what’s another word for dream? I don’t know what the general collecting public thought at the time, but for me, these were the most coveted inserts of the year. I love seeing the stat lines on the front, too. 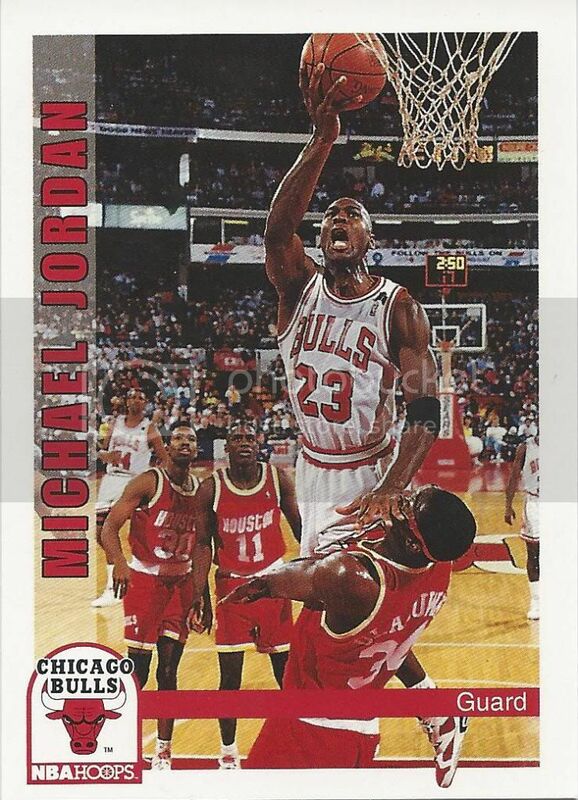 1990-91 Fleer #26 Michael Jordan UER/(Led NBA in scoring 4 years, not 3) – Jumpman logo on cardboard. The tongue is out; the legs are aerodynamic; the dunk is happening. Even better is the Knicks are so far away looking on in amazement. Sorry, Patrick Chewing. You ain’t catching him this time. 1992-93 Hoops #30 Michael Jordan – This must be Pamplona, because Hakeem Olajuwon just got run over by a Bull. And again, we have opposing players Kenny Smith and Vernon Maxwell standing in awe with no concern for their trampled teammate. 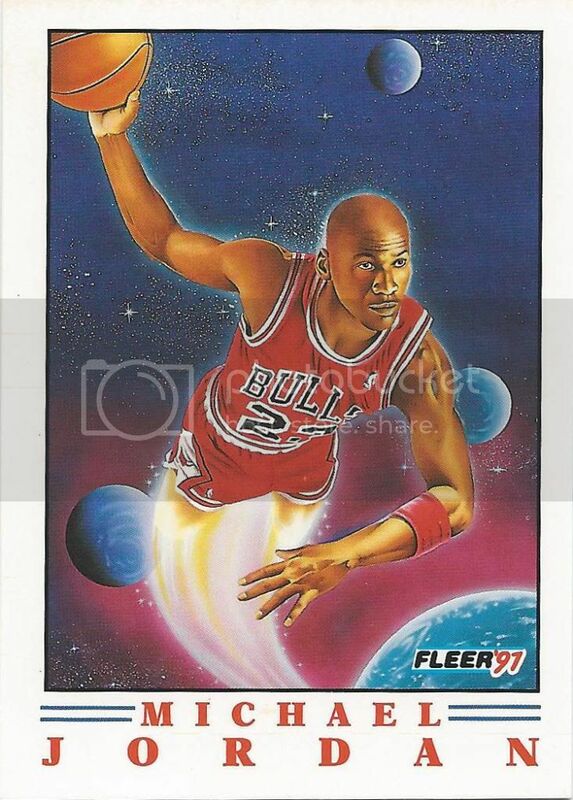 1991-92 Fleer Pro-Visions #2 Michael Jordan – Ho hum. Just flying into space. In such a gaudy set, this is the one with the blue NBA logos down the left third, the Pro-Visions insert was a welcomed and very noticeable breath of fresh air. I remember fanning my packs hoping to get a glimpse of white in the sea of blue. All of the drawings are fantastic in the 6 card insert set, and I’m sure I have them all in various binders to show off another time. 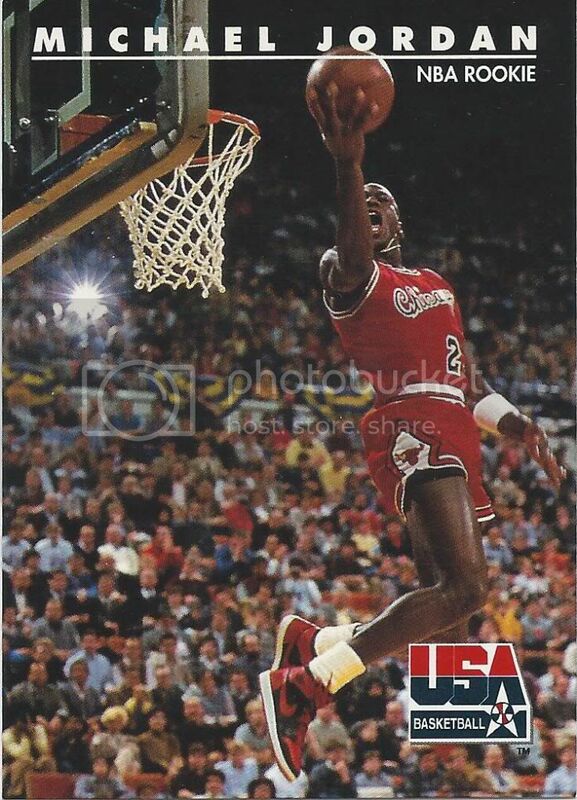 1992 SkyBox USA #38 Michael Jordan/NBA Rookie – I had to include a card from what may be my favorite basketball set of all-time. The 1992 Skybox USA set came out before an Olympic game was played, so instead they gave each roster member 10 cards showcasing highlights from their careers. This is the most dynamic of the pictures and it, like the Archives card we say previously, is another example of a non-Rookie rookie. Who needs a real rookie card when you can look at this? That said, I’ll take any extra Jordan rookies off your hands. 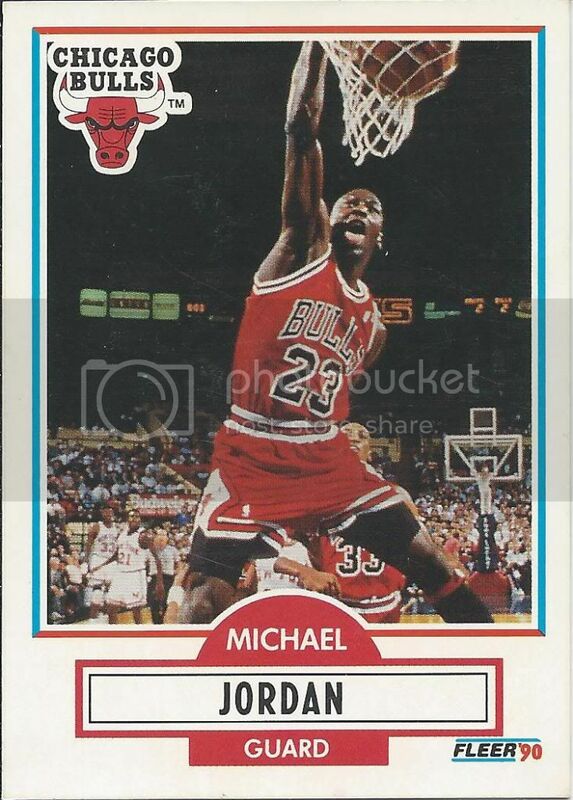 1991 Upper Deck #SP1 Michael Jordan – Even without knowing what my collection includes, you were likely expecting this one to pop up sooner or later. Yup, I got one. I don’t remember if I bought it, traded for it, or found it in a pack. I think we all knew that the baseball thing wasn’t going to pan out, but give Upper Deck credit for riding that wave and creating another iconic card out of it. The reason you all expected it is because it is that well-known and that memorable. 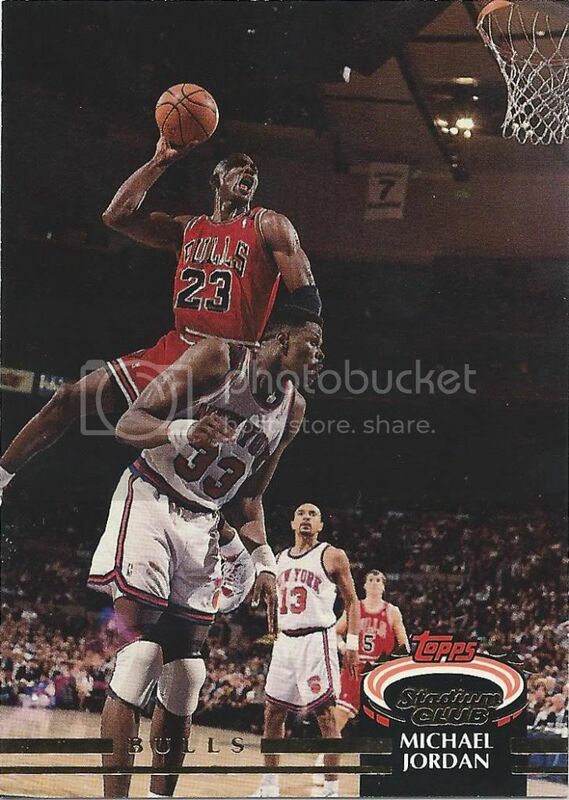 1992-93 Stadium Club #1 Michael Jordan – Patrick is front and center for this performance. Thanks for the lift, buddy! I’ll be honest, if Jordan were posterizing any other team, you’d be seeing another card at #3. Well, maybe if it were Manute Bol. Anyway, I absolutely love this picture. I loved 1992-93 Stadium Club. This is what premium looks like. 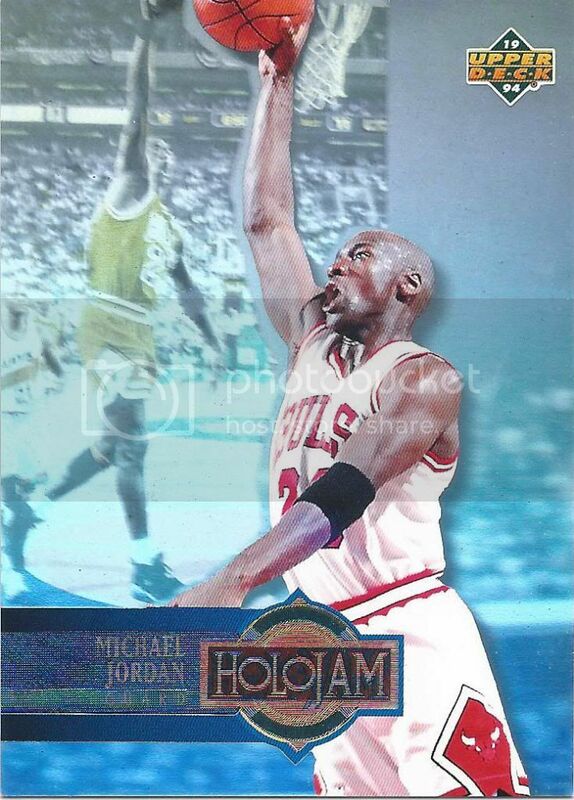 1993-94 Upper Deck Holojams #H4 Michael Jordan – This one is the biggest surprise, even to myself. Comparing it against card after card after card, it won out. I like shiny stuff, but it’s not typically top three material. What puts this in the runner-up slot is a near perfect balance. There’s a ton of shine and flash and pizzazz to draw your attention, but it’s paired with a large non-shimmering picture. Left and right working together. It’s nearly a mirror image with the hologram and photo Jordans dunking on the same bucket at the same time. Glorious, but not quite the best. 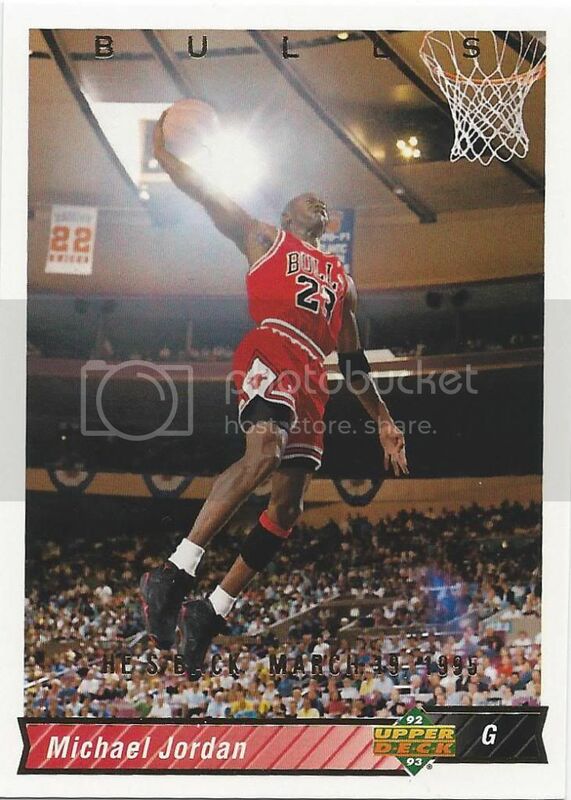 1994-95 Upper Deck Jordan He’s Back Reprints #23A Michael Jordan/(92-93 Upper Deck) – There are a lot of subconscious elements to this card that make it #1. Consider the low angle. Here we are at ground level looking up at this great athlete towering above us. We’re given a viewpoint similar to what we’ve seen earlier in the top ten from Kenny Smith or Ewing. The light on the ball is serendipitous timing. It turns this dunk into a near spiritual experience we’re witnessing. The lack of other players in the picture subtly reinforces that he’s alone in a class literally above the rest. The 1992-93 design is a fantastic specimen in its own right, and the understated foil adds that extra touch. You may notice that I actually chose a reprint instead of the original. Everything is exactly the same except near the bottom, there’s a stamp celebrating Jordan’s return to the NBA. 10 years and 8 days ago, Michael Jeffrey Jordan made his un-retirement official. Upper Deck released this insert set reprinting several of his most memorable older cards, so it’s only fair I honor it too. If I were to compile this list six months from now, I’d probably have a different order, but as of today, right now, this is my favorite Jordan card and these are my top 50. I hope you enjoyed the countdown, even if you’re not a basketball card fan. Michael Jordan transcended the sport in several ways. The least I could do is break away from the baseball focus for a few posts. I really enjoyed reading your countdown list. It was nice to see a fellow UD Hologram fan. 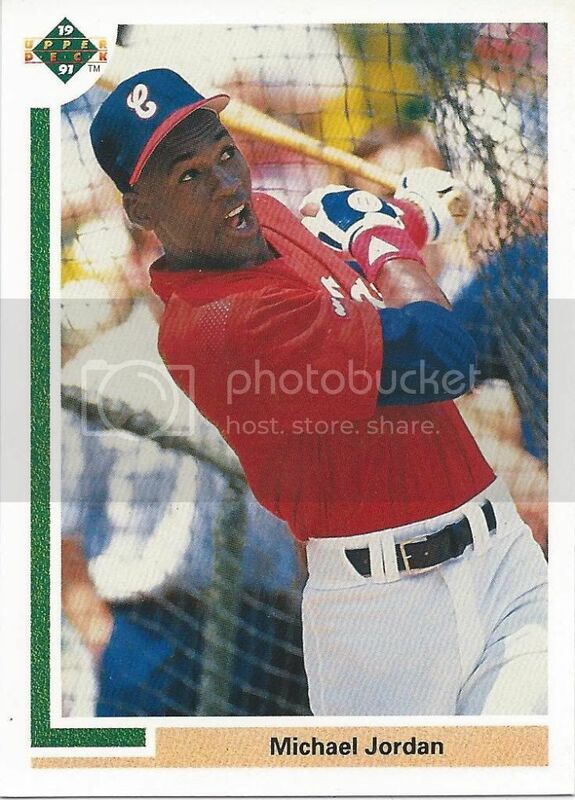 And that 1991 UD Jordan baseball card is awesome… definitely top 5 for me as well. Excellent. I’m thinking of Jordan for some reason. So I have tons of baseball cards and have just pulled them out after a good 20 years. I need scoop. Is the value up or down these days? I know nothing. Really enjoy your chooses unlike most you didn’t choose because of rarity or high value, Just the ones you enjoy most!! I think you didn’t a great job I have 90% of them but hope to have all soon maybe one day I’ll make a top 50 or 100. I have the Bugs/MJ upper deck card for you. How much will you give me for it? ?